How Long Dubai Water Canal? What Does the Cruise Encompass? 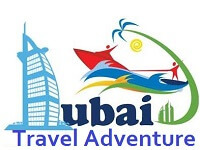 How to Go to Dubai Water Canal? 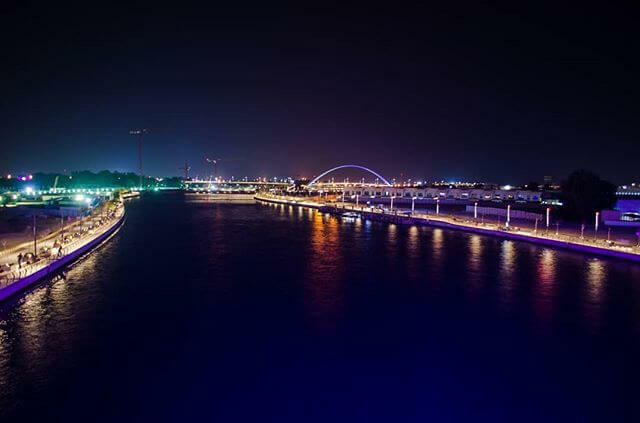 Dubai water canal is the newest AED 2.7 billion man-made island in Dubai that connect Business bay to safa park. Dubai Water Canal, a 3.2 km long waterway, completed in 2017. Beginning at the Dubai Creek, the canal runs through the Shaikh Zayed road. Passing along the Safa Park and Jumeirah District, it connects with the Arabian gulf. Passing along the Safa Park and Jumeirah District, it connects with the Arabian gulf. One thing that blew up my mind was when a boat comes near to Dubai water canal waterfall sensors sense it and waterfall stop for a while and let the boat pass under the bridge. The views along the water canal are mesmerizing and these amazing exhibits can be enjoyed either by taking an abra ride or a dhow cruise across the canal. The abra rides are shorter and if you are looking for a more enlightening experience take a dhow cruise across those tranquil waters full of delights. The dhow cruise begins and ends at the same location every day. The passengers board the dhow at the pier near the Festival City Mall at 7:30 p.m. The cruise begins at 8:00 p.m. daily and ends at 10:00 p.m. while the boarding time is 7:30 p.m.
Another Night view of Dubai Water Canal. The dhow is a modernized version of a traditional dhow to showcase the glitz and the glamour of the city. The special glass enclosed cruise ship will give you the experience of a lifetime. The luxurious ride gives you a view of the glamorous sights of the city coupled with a fine dining experience. You could not have asked for more!While you gliding across the gently lapping waves of the waterway you can relax and enjoy the beautiful, glittering skyline of the city of lights. The 2 hour cruise holds plenty for both the young and the old. The delights consist of breathtaking views along the canal combined with on board entertainment. There is no official rules for Dubai Dhow Cruise dinner menu.Every tour operator has own rules and they charge you accordingly. As you step on board the stylish dhow, you will be served with a delicious, hot drink. This is a traditional Arabic coffee known as ‘Kahwah’ greatly enjoyed by the locals. The welcoming drink is accompanied by soothing Arabic music that will play in the background while sail over the waters, complementing the journey beautifully. The Kahwah will then be followed by chilled refreshments and dates. You will then be escorted to your table, where a 3 course dinner awaits you. The dinner is quite extravagant and commences with a cream of tomato soup preceded by starters, which consist of bite sized chicken kebabs (round patty-shaped), potato and cheese croquettes which are served with tomato ketchup. A live cooking station will be offering either pasta with condiments or roasted lamb rack with a selection of sauces. Meanwhile the Tanoura Dancers will keep you engaged with a couple of dances as you indulge in the delectable meal. The Tanoura dance is a folkloric dance where the dancers, dressed in colorful skirts swirl around in whirling motions. You might even get the chance to let your inner dancer break free there. While there is much on board to admire, the attractive sights surrounding the canal will be a special treat for your eyes. As the dhow sails gently on, you get to witness the world’s tallest tower Burj al Khalifa, the Business Bay Bridge, Safa Park, Dubai Festival City Mall, Westin Hotel, JW Marquis Hotel. 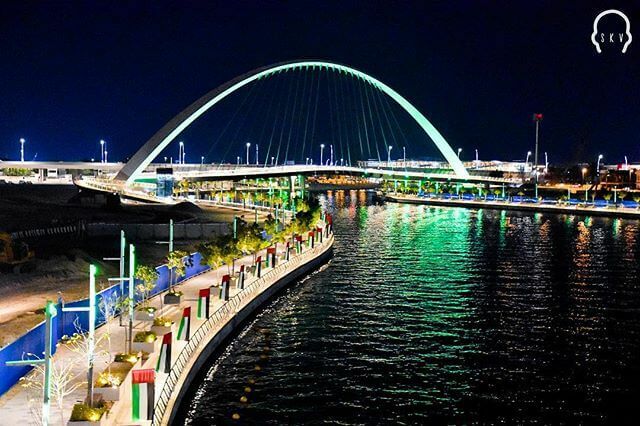 There are 5 pedestrian bridges on the canal all spectacularly lit, and as the dhow drifts underneath the sheikh zayed road bridge you will find yourself enthralled by the illuminated waterfalls. These mechanically operated waterfalls have motion sensors installed so that any passing boats or abras can be detected in time to stop the waterfalls and let the sailing vessels through. But, be warned, when you’ll be passing under them , you shall constantly feel the dread of the waterfalls resuming while your still in the way (though such a case has never occurred, not publicly at least). There is just so much to feast your eyes on that there cannot be a single moment of boredom. The tickets can be obtained at the boarding place. However if you wish to pre-order that is obviously better to avoid subsequent hassle and disappointment at the last moment. 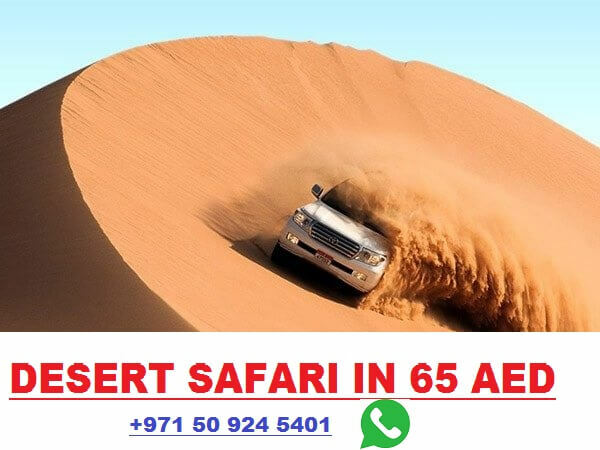 .The rates vary starting from 150 AED. Adults are charged a higher and are considered to be above the age of 8 while tickets for children under 3 years of age are free of charge. The children must always be accompanied by adults. The Dubai Water Canal Cruise drop-off location will be the same as the pick-up location that is the pier near Dubai Festival City Mall. Since Dubai water canal is still not famous so lots of peoples have no idea how to go Dubai water canal. Listed below are two best option to get there. The most effective way to arrive at the Canal by car is to go on the side of Shaikh Zayed Road in the direction towards the Dubai World Trade Centre. Well before even getting to the newly raised area of the highway, there is an exit that is next to St. Regis Hotel. Take this exit that will get you underneath Shaikh Zayed Road and you are able to park your car beneath the bridge. Car parking fees apply. Regardless of which part of the city you are, grab the Metro on the way to UAE Exchange MS and drop off at Business Bay. 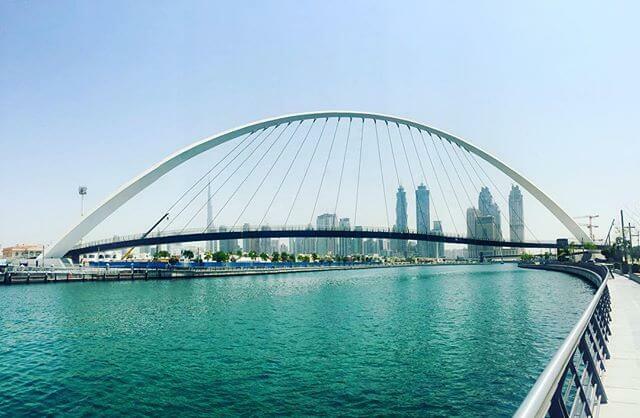 Cross the bridge towards the other side of the road and step towards the Shaikh Zayed Road Bridge. There will be a lift beside the walkway and this will take you directly into the center of the Canal. So here’s wishing you a fantastic, pleasurable time aboard the dhow cruise for a quintessential experience across the magnificent Dubai Water Canal.